Note: Indiana University East School of Nursing and Health Sciences is preparing highly-qualified nurses for today’s healthcare professions. This is the first story in a four-part series to feature how today’s faculty and alumni are working with nursing students to prepare for the future. The full series is available at iue.edu/nursingexperience. Five faculty members at Indiana University East have been named grant recipients for research projects and course development. The faculty will be presented with their awards during the Faculty & Staff Annual Award Ceremony on March 29, 2018. For Indiana University East the past year has brought many celebrations, accomplishments and memorable moments. As the new year begins, IU East reflects on 2017. IU East continues to be an innovative leader in online education. In June, a book collaboratively written by 42 faculty members, across 25 disciplines, was released to share the wealth of experience and knowledge IU East faculty have gained in designing and instructing online courses. The book, “Best Practices in Online Teaching and Learning across Academic Disciplines,” was released in August. The book continues to gain attention. This November, Inside Higher Ed published a book review on the text. Indiana University East is pleased to welcome new faculty members to the School of Nursing and Health Sciences. Macy Bennett, lecturer in nursing, received her Master of Science in Nursing Education from Ball State University and her Bachelor of Science in Nursing from Wright State University. 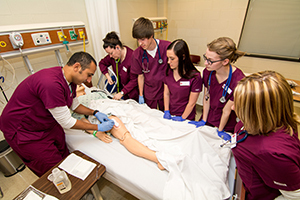 IU East School of Nursing and Health Sciences was named one of the “Most Affordable Nursing Degrees in Indiana” by CollegeChoice. The Indiana University East School of Nursing and Health Sciences has been named as one of the “Most Affordable Nursing Degrees in Indiana” by College Choice. 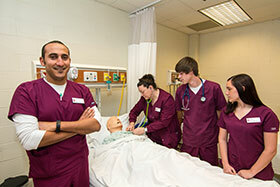 The School of Nursing and Health Sciences is the second ranked school on the top 10 list. Indiana University East will offer a Bachelor of Science in Applied Health Science degree online beginning fall 2017. The degree program is in collaboration with Indiana University Online, and jointly includes IU Kokomo, IU Northwest, IU South Bend and IU Southeast. The program encompasses 120 credit hours and is designed to enhance potential for career advancement in entry- and midlevel positions in health-related organizations. Two tracks will be offered: community health education and health administration. The Recognition Ceremony for Indiana University East nursing graduates will be held Friday, May 12, beginning at 2 p.m. with a slide show followed by the ceremony at 2:30 p.m. The annual Recognition Ceremony for nursing students will be held at the Ligthhouse Assembly of God, located at 2339 West Cart Road in Richmond. Mina Samaan (far left) will graduate this May with his Bachelor of Science in Nursing degree. Mina Samaan has faced loss, poverty and persecution. A determination to improve his life and give back to others has propelled the graduating senior to complete his Bachelor of Science in Nursing degree from the Indiana University East School of Nursing and Health Sciences this month. Indiana University East was named to the 2015 President’s Higher Education Community Service Honor Roll. This designation is the highest honor a college or university can receive for its commitment to volunteering, service-learning, and civic engagement. The Honor Roll list is available online. The Indiana University East School of Nursing and Health Sciences honored four individuals and the Lighthouse Assembly of God with Nursing Excellence Awards during its gala “Excellence Beyond Borders” on October 29. The nursing gala was held at Forest Hills Country Club in Richmond.